This article appeared in the Fall 2006 edition of Sacred Music journal, published by the Church Music Association of America. It is reprinted with the kind permission of Jeffrey Tucker, Managing Editor, and the author, Dr. Treacy. One of the four Marian antiphons traditionally sung at the end of Compline or Vespers, Alma Redemptoris Mater is a beautiful prayer of intercession to the Mother of God. The liturgical season during which it is appointed to be sung is the period from after Compline for the First Sunday of Advent until after Compline of February 2, the Feast of the Presentation of the Lord (or the Purification of the Virgin) in the Temple, Candlemas. The poem was once attributed to Hermannus Contractus (d.1054), and was so well known in England that it was mentioned in the "Prioresses Tale" of Geoffrey Chaucer’s Canterbury Tales. to thine own sacred Creator. This lovely homophonic version of Alma Redemptoris Mater has a meditative quality, a quality of hushed wonder and expectation appropriate for the seasons of Advent and Christmas. This four-voice motet is based on the more ornate version of the Gregorian chant setting of the antiphon. Just as a chant might be intoned by a cantor, so the opening word, "Alma," is sung by the tenors (or basses), and it is based on the beginning of the chant melody.2 The full choir responds with "Redemptoris Mater," in block chords, though for the word "Mater" the sopranos and altos blossom in a little melisma of admiration for the Blessed Mother. The composer took care to use at least some of the chant melody, usually in the soprano voice, for each corresponding line of lyrics. There are a few moments of word painting that add vividness and drama to this motet. The phrase "succurre cadenti" [help the fallen ones] is to descending vocal lines in the outer voices, the soprano and bass. Immediately after that, all four voices leap up, some as much as an octave, at "surgere" [rise]. As if to set off the wonderment of nature at the miracle of Mary as mother of her Creator, Palestrina sets the words "tu quæ genuisti, natura mirante" completely homo-rhythmically, with all four voices moving together in exactly the same rhythm, except for the hesitation of the alto voice at "tuum sanctum Genitorem." This hesitation seems to suggest astonishment at Mary’s special role in our salvation. The words "sanctum Genitorem" [holy Creator] shift momentarily into triple meter; a reference, perhaps, to the Trinity? The liveliest part — if it truly can be called lively — of this serene motet occurs next, at the words "Virgo prius ac posterius" [Virgin before and after]. A duet, with the sopranos descending while the altos ascend in quicker, eighth-note values, is echoed by a tenor-bass duet with the same notes, and then a repetition by the sopranos and altos of the beginning of that phrase. "Gabrielis ab ore" [from the lips of Gabriel] brings the voices together again and involves a brief shift to triple meter at this mention of the messenger of God. The final phrase, "sumens illud Ave, peccatorum miserere" [accepting that greeting, have mercy on sinners] begins with all voices moving together on "sumens illud," and the sopranos singing a four-note ascending figure. 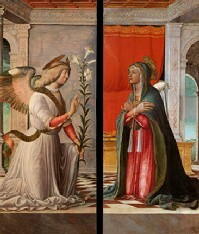 This moment reflects the stillness of the Virgin’s acceptance of the angel’s message. With the word "peccatorum," the texture becomes more active and contrapuntal. In fact, the basses sing the paraphrased Gregorian chant melody, followed by the sopranos, and then the tenors, as if to beg repeatedly the Virgin’s intercession. It is my hope that the "exegesis" of this motet may help choirs not only to sing this exquisite piece, but also to pray it. The mysteries of Advent and Christmas are gloriously served by Gregorian chant and by great composers like Palestrina. Your choir will love singing Alma Redemptoris Mater, and I predict that it will dispose the choir and the congregation towards the peace and reverence that should be true hallmarks of the Advent and Christmas seasons. Alma Redemptoris Mater is available from CanticaNOVA Publications. This edition is edited by Andrea Angelini and is printed in the key of D major, which makes it comfortable for most tenors. Alma Redemptoris Mater is also available from the Choral Public Domain Library, as edited by Abel Di Marco. The source website is in Puerto Rico. This edition is higher, having been placed in the key of E major. In some choirs it might be necessary to have some altos assist the tenors, at least in the first part of the motet. This setting is also available here. CD – Ave Maria. Ascension Music Chorus, Dennis Keene, Conductor. Delos International DE 3138. This CD was later retitled Mysteries Beyond. CD – Prince of Music: The Greatest Choral Music of Palestrina. Voices of Ascension, Dennis Keene, Conductor. Delos International DE 3210. Alma Redemptoris Mater from the Ave Maria album is one of three "bonus tracks" added from earlier recordings. CD – Musica Dei "God’s Music": Choral Music of Giovanni Pierluigi da Palestrina & Orlando di Lasso from the Golden Age of Polyphony. Amor Artis Chamber Choir, Johannes Somary, Conductor. Newport Classic NPD 85603. 1C.F. Peter Ackermann, "Palestrina, Giovanni Pierluigi da," in Die Musik in Geschichte und Gegenwart, Personenteil, 13, ed. Ludwig Finscher (Kassel: Bärenreiter, 2005), col. 25. 2The editions give the incipit of the simpler Alma Redemptoris Mater chant, but this is surely an error, since that is a more recent melody; performers should use the intonation from the earlier, "solemn," version of the melody; cf. Liber usualis (Tournai: Desclée, 1963), p. 2734. Susan Treacy is Professor of Music at Ave Maria University.